Welcome to Handmade By If, a small creative business based in Haworth, West Yorkshire, founded in 2012 by me, Rhiannon Taylor. I have a background in Graphic Design and had been struggling to find artworks for my home that were beautifully designed and crafted, personal to me and yet still affordable. So I began to design my own typography prints. I wanted my home to be a positive and creative space that was 100% me. A place to be playful and ponderous and to feel uplifted after busy days at work. My designs reflected this and friends began to request their own versions for themselves and as gifts for their friends... and lo! Handmade By If was born! We are still a small and happy team imagining, designing and sending our products out from our studio in Haworth. 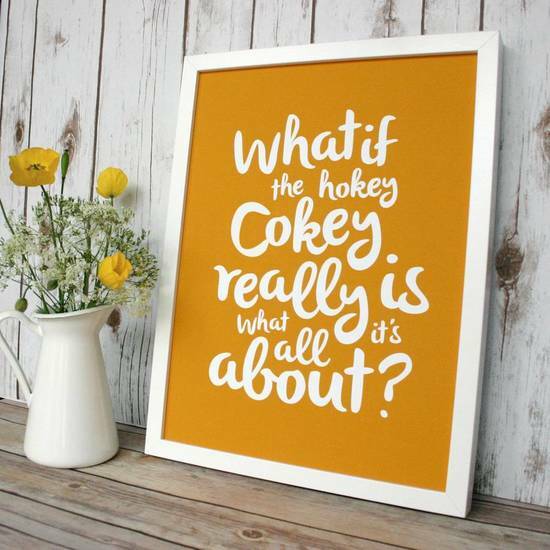 We now offer a wider range of products from clothing to homewares as well as the original prints, and we love helping our customers to create their own playful and positive spaces. We always have new ideas on the go so look out for our new products (still tested thoroughly by ourselves and our very patient friends!). We also care about the people who create our outsourced items (such as our t-shirts and sweatshirts) and ensure they are made by workers who enjoy a freedom and quality of life we would hope for ourselves and that they are made responsibly and sustainably.